It's summer, so brief a season in the Northeast. Time to kick back a little and enjoy science, instead of attending an endless series of meetings about Vermont Yankee (though the talking fish are amusing). If you also want to kick back a little, let me recommend the 11th Carnival of Nuclear Energy, now playing at Next Big Future. Watch Dan Yurman take a hatchet to the latest New York Times hatchet job on nuclear, while I comment on an editorial in the Brattleboro Reformer and Rod Adams discusses nuclear proliferation and why it can't happen with used power-reactor fuel. 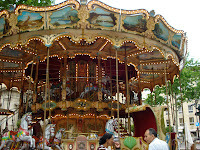 Only one location has all these features, and it's the Carnival! A Gordon Conference is a heady atmosphere of scientific excitement and cooperation. I would go just for that, in all honesty. The difference between a Gordon Conference and a local hearing about Vermont Yankee--it's as if these events take place on two different planets. I don't just go for the atmosphere, however. I worked toward my Ph.D. in high temperature chemistry and geochemistry, and part of my working life was also spent in that world. To me, the problems of energy are materials problems. That kind of sums it up. These are huge issues. These issues are reality. The Carnot cycle controls the theoretical efficiency of heat engines. It pushes us to operate at higher temperatures, because it mandates that if you get more efficiency from a heat engine when you run the hot part of the cycle to a higher temperature. The problem is that only a few materials can maintain integrity at high temperatures, and even these materials have their temperature limits. Conference presentations cannot be reported (see note below about Gordon Conference philosophy). However, I did find a good website about gas turbines materials development. This site describes some of the aspects of developing and using high temperature materials. At lower temperatures, you have more choices. The availability of many well-characterized materials for low temperature construction pulls engineers to design processes at lower temperatures, giving up some thermodynamic efficiency for flexibility of design and ease of operation. At the conference, I showed a poster (poster session) about some aspects of development of the Liquid Fluoride Thorium Reactor. Just for fun, I include a video on this subject. This video is a ten-minute remix of three one-hour talks. Sit back and enjoy! The Gordon Conferences are very specialized meetings for researchers in a specific field. They are small and they are set up for free exchange of information. People cannot quote your Gordon Conference material later, and no hard copies are handed out. This encourages suggestions, discussion, and the willingness for scientists to go out on a limb and float new ideas to their peers. Conference sessions are held in the morning and the evening, with free time in the afternoons for hikes, swimming, and scientific discussion. Gordon conferences are deliberately international in scope. Scientists from at least twelve countries were present at the conference I attended. The Brattleboro Reformer is not known as a friend to Vermont Yankee. Most people at the plant refuse to read the paper, calling it the MisInformer. The Reformer editorial policy can be summarized in three words: Shut It Down! So imagine my surprise when I read the July 14 editorial entitled: Just the facts, please. Now, I don't want to oversell this editorial. It does not support VY's continued operation, and ends by urging people to give money to the most effective anti-VY groups. The opponents of Vermont Yankee nuclear power plant’s continued operation are passionate, emotional and rightly concerned about the health of their children, themselves and the environment. But many of the claims used to support their stance are not hard cold facts but rather exaggerations, misinformation and downright wrong, which do not serve their cause well. For example, there were cries of distress when the Department of Health revealed that bones from fish caught near the power plant tested positive for strontium-90, proof the plant has been leaking radioactive materials into the environment. A spokesman for the Vermont Department of Health told the public that the strontium levels were normal and within the background levels that are a result of the meltdown at Chernobyl and weapons testing that went on until 1965. Even the river steward of the Connecticut River Watershed Council, a fierce opponent to the plant’s continued operation, said the levels were normal. So if you are opposed to the plant operating past 2012, put your money where your big mouth is, become better informed and stop the childish outbursts and juvenile foot stomping. Wow. What happened in Brattleboro? As the editorial noted, the Vermont Department of Health, and a well-informed anti-nuclear group (among others) noted that the fish in the Connecticut River contain only background levels of radioactive strontium. However, as I have noted in earlier posts, that has not prevented groups from marching in the Brattleboro Fourth of July parade as radioactive fish, showing up at meetings as radioactive fish, etc. It did not prevent Shumlin from stating that radioactive strontium was attacking the teeth of children in Vermont. In a post called Destructive Lies, published in June, I stated that the lies of the anti-nukes were destroying the Vermont Brand. I think that when the (not) radioactive fish walked down the street in Brattleboro in the Fourth of July parade, other people also noticed this. (You can't help but notice a human-sized, three-eyed fish.) Other people saw this and became aware of what the anti-Vermont Yankee lies are doing to Vermont. People in Brattleboro will no longer accept lies about contamination and dangers caused by VY. I want to give a tip of the hat to Rod Adams, for his excellent post on pro-Indian Point citizens coming out to testify in New York. We can all learn from this! We have to be out there and visible. Especially now that the fish has turned. Why Did Jaczko Come to Brattleboro? I have been boots-on-the-ground for Vermont Yankee since 2002, and before that active in Massachusetts and Maine. From this perspective, Jacczko's visit was CYA for the NRC and himself. You haven't seen this in the press reports so far and probably won't. Meredith and I were there. He stood up to the opponents and stood them down too. The Chairman told them that the NRC regulates by focusing on safety and what is most critical to safety. He would not let the responders interrupt him, as is their custom. He told them when they were over their time limit. They all spoke beyond their limit, as is their custom. Jaczko also told them that the NRC staff is concerned about all the same issues they are, but has different judgments about them. 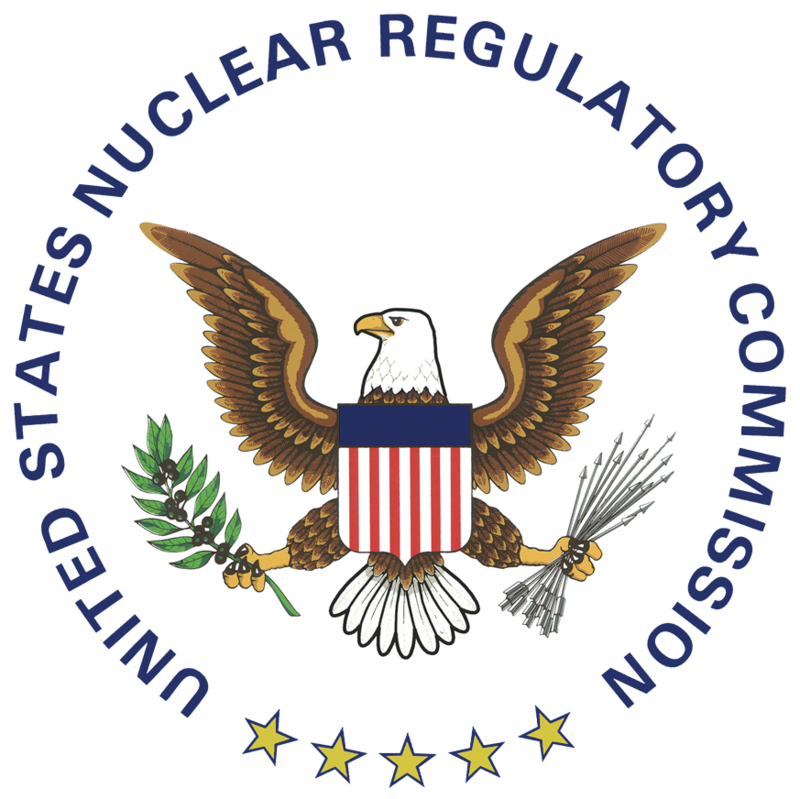 Finally he said that the NRC does not have unlimited power, and has not seen any issue requiring immediate shutdown, as called for by the Vermont Yankee Decommissioning Alliance. He also said they can act fast if they have to. No need to worry about this event giving a publicity opportunity to these opponents. They are experts at generating coverage and get plenty due to the plants missteps. The press is mostly on the opponents side (surprised?) and as in any story line, "If it bleeds it leads." The plant has been cutting itself and bleeding regularly. The major problem for supporters of VY is getting them to do much more. They don't stand up to charges. They don't go face to face with the antis. What is the press supposed to think? True, the plant is stuck with responding to generic global issues too, but there is help available. What former Senator Simpson from Wyoming said recently in Newsweek is true. "A charge unanswered is a charge believed." Deb Katz of Citizens Awareness Network spoke at a rally last year on the State House steps with the President Pro Tem of the Senate and the Speaker of the House behind her and said that they would shut down VY, then the plants in the US, then the world. These antis will be "coming soon to a plant near you." Dan Yurman of Idaho Samizdat asks the question: "What Was Jaczko Thinking?" in his post on the NRC Road Show. Rod Adams of Atomic Insights considers who was invited and who wasn't invited to the meeting. There are over 30 comments on this post. 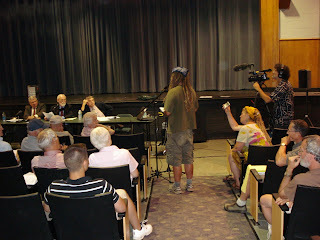 Last but hardly least, someone from Nuclear Townhall attended the meeting in Brattleboro. An excellent post about Jaczko taking the heat at the meeting. This post also notes how the observers in the meeting booed and hooted when Jaczko said nobody was hurt at Three Mile Island. The Tenth Blog Carnival of Nuclear Energy is up at Next Big Future. This edition features Robert Hargraves discussing the importance of energy for ending poverty. 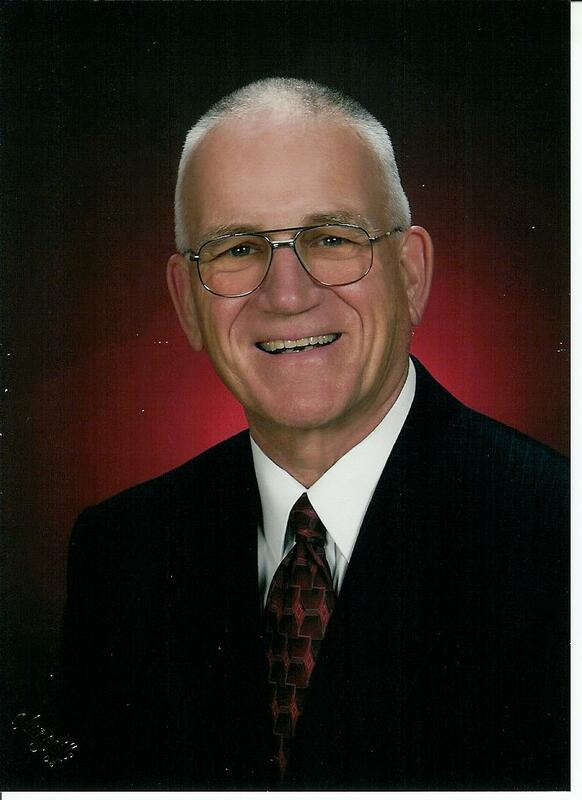 Howard Shaffer III wrote this guest post. He is a former submarine officer, Congressional Science Fellow in 2001, and currently a registered professional nuclear engineer in Vermont and New Hampshire. He was one of the startup engineers at Vermont Yankee. Meredith is currently attending the Gordon Conference on High Temperature Chemistry and Materials. Today, in the Green Mountain Daily, Ms. Maggie Gundersen made several statements about me which are not true. My first idea was to ignore these statements. However, my friends told me that a charge un-answered is a charge believed. Okay. I'll answer. My second idea was to answer the statements by leaving a comment on the Green Mountain Daily site. Unfortunately, you have to create an account on that site in order to post a comment. In other words, you have to give Green Mountain Daily your email address, get a password, etc. Setting up such an account is usually considered to be "opting in" to mailings from a web site, and becoming an addition to the site's mailing lists. Most people believe you should only set up such accounts with websites you trust. Since the latest Green Mountain Daily posting is filled with lies about my affiliations and background, I don't trust the site. Obviously, I chose not to set up an account. Please note. I am not accusing Green Mountain Daily of mis-using their email lists. I am simply saying that I don't personally trust them, and I don't want to be on their lists. So I had a third idea: answering the charges on my own blog and hoping Ms. Gundersen reads it. That's what I am doing here. So. What did she say? Material in italics is written by Ms. Gundersen. 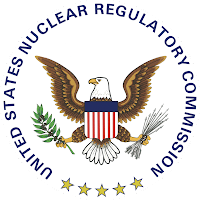 Finally, pro-nuke blogs from around the country, led by Vermont's own Nuclear Energy Institute's connected Yes Vermont Yankee, also jumped in to condemn the NRC meeting with the Intervenors. Where to start on Gundersen's assertions and lies? Insider: I like the "insider" statement, so I will start there. Yes. I am very knowledgeable about nuclear energy. Does this make me an "insider" or an "authority"? You can guess the word I would choose. Connections: I am not sure what Ms. Gundersen means by "heavily connected" to the industry. Does "heavily connected" mean that I read blogs and have friends? That I used to work in the industry? All true, and nothing I am hiding. (My blogger profile is a pretty good summary of my background. ) Perhaps Ms. Gundersen would like to be described as "heavily connected to anti-nuclear groups"? Sounds kind of sinister, doesn't it? Sourcewatch and Google: I'm not on SourceWatch, and Googling me shows boring stuff about this blog and my company, Carnot Communications. However, there is a Meredith Angwin who lives in Australia, used to work for IBM, and visits Thailand. When I Google myself, I find her. I think she leads a more interesting life. Down to the Real Issue: Do I Get Paid? I do not "receive income from the nuclear industry" except for an occasional free-lance writing job for Fuel Cycle Week. These small freelance gigs add up to less than $1500 a year. This is not a major part of my income. Ms. Gundersen also accuses Rod Adams of being an insider and "receiving income." Rod is a Naval Officer and unpaid nuclear blogger. He writes for Fuel Cycle Week on occasion and probably makes about the same amount of money I do. I know Rod pretty well, and he has no other income from nuclear. Mr. and Mrs. Gundersen are heavily connected to anti-nuclear groups. (Hmm. I might enjoy writing this way. Live and learn...) Mr. Gundersen used to be paid by the New England Coalition. Now, Mr. Gundersen gets lucrative contracts on Vermont legislative panels, where his main activity is attacking Vermont Yankee. Mr. Gundersen's going rate in Vermont is $185 to $300 an hour, according to public records. Unfortunately, though the contracts are public records, they are not easy to access. However, I was informed of Gundersen's rates in emails from the Vermont Department of Public Service (DPS) and the Vermont Joint Fiscal Office. The Joint Fiscal Office also sent me a copy of their contract with his company, and I think I might be able to find the DPS contract if I were willing to spend more time on it. Okay. I will also admit to finding these contracts a little weird, because Gundersen is not a Licensed Professional Engineer, and I thought that state governments were required to hire Licensed Professional Engineers for engineering assessment projects. At any rate, we see that anti-nuclear activists often make a living at activism. Sometimes, like Gundersen, they make quite a good living. I don't have a job in nuclear. I don't get paid for blogging. I receive trivial amounts of money for writing occasionally for Fuel Cycle Week. I think the Gundersens should follow my lead, and simply do everything they do---for free. They should aim at true purity of purpose. Or maybe, just maybe, they should do whatever they want to do and earn money from people who will pay them. You know, it's a free country and all that. However, they should also stop lying about how other people earn money, what institutions other people are associated with, and so forth. Instead, they should spend some time putting their own rather questionable (professional engineer? anti-nuclear guru?) house in order. Tomorrow morning, Chairman Jaczko of the NRC will be in Brattleboro. Jaczko will be at the Ramada Inn in Brattleboro from 9:30 to 11 a.m. He will be taking questions from the seven groups that have concerns about Vermont Yankee. I don't have a complete list of groups, but VPIRG, NEC, the Safe and Green Campaign, and the Conservation Law Foundation are sure to be included. The rest of us are allowed to watch these groups question Jaczko. Since nobody else can ask questions, this blog post is more of a call-to-inaction than a call-to-action. For most people, there's no real reason to go. I'll be there. I blog about VY, so I can't skip this event. Also, I am covering the meeting for a trade journal (press badge hat instead of blogger's hat). At 11 a.m., after Jaczko's discussion with the intervenors, he will give a press conference. As I understand it, he will then spend the afternoon at VY. Two days ago, I spent three hours at a Public Service Board meeting, mostly listening to interveners express their fears. Therefore, I'm not filled with enthusiasm about attending this meeting. Still, I like to make things interesting for myself. Gambling always spices things up. Who will take my wagers? No money will change hands. However, I hope to settle the bets in the traditional surroundings. Salt hill pub in Lebanon probably. Or a similar venue. Take up these wagers by adding a comment to this post. I bet that the intervenors will grandstand and ask long, loaded questions, and hardly let Jaczko get a word in. My wager: more than three-fourths of the air time will be taken by the intervenor "questions." Who will wager against me here? One intervenor is famous for shouting while other people are talking. He shouts things like "It's a lie" or "Junk Science." My wager: One intervenor will interrupt Jaczko by shouting. Who will wager against me here? Another intervenor throws things. I don't think she will do so, though Da Commissioner is a very tempting target. My wager: The slinger does not sling anything tomorrow morning. Who will wager against me here? Colorful costumes are the order of the day at these meetings. My wager: Somebody in the audience will dress as a fish. Who will wager against me here? Someone will get confused, and instead of talking about tritium and accusing VY management of lying, they will accuse tritium of lying. My wager: Tritium will be accused of lying. Who will wager against me here? I'll probably lose the last bet (number 5) now that I have warned everyone of the possibilities. Bet against me on any of these! It will be like taking candy from a baby. Really. Easy. Place your bet in the comment section. people who work at the plant. In our view, having a one-sided stakeholder meeting with anti-nuclear activists to discuss the future of Vermont Yankee during your visit to the state sends a negative message to supporters about the NRC’s position on this issue......Though we have repeatedly sought an audience with you during your visit, we are formally requesting that you grant us time to meet with you and senior members of your staff to speak with us and other business and labor leaders in Vermont. That business happened to be one of the more energy intensive operations in town; our electric bill could run as high as $8,000 per month for a little plastic product manufacturing enterprise with an annual revenue of less than $1 million. As he says in the post, he would have been furious at being excluded from an important meeting about electricity with a distinguished visitor who had come to town. Please send in your comments to the Commissioners. The Public Service Board (PSB) Commissioners are receiving hundreds of comments on docket 7600. This docket proposes to shut down Vermont Yankee immediately. Even up the balance! The opponents have organized campaigns to send comments to the PSB, and we have to send comments also! You can file a comment using the PSB general Comment Form. Choose "other" from the Drop Down list, and head your comments with the words "Docket 7600." The picture above shows the scene near the door of Brattleboro High School on July 8, just before the PSB meeting on Docket 7600. That's me on the left (green shirt, purse). My own picture of the man in the fish costume didn't show all three eyes, but Howard Shaffer was kind enough to send me this picture. If you double-click on the picture, you can read the sign "Revoke the Certificate of Public Evil." I suspect the fish was part of the Safe and Green Campaign's Fourth of July event, focusing on "radioactive fish." The fact that all fish have only contained background levels of radioactivity doesn't matter much to the foes of the plant. The fish are NOT radioactive, but with a fish costume and a few lies, the facts won't matter. As I approached, the fish began talking to me. "Hi Meredith," it (he?) said. "See what your tritium has done to me? I have three fins!" (It had three eyes and two fins, actually.) After a few moments banter, the fish said he was going to eat a banana, and I warned him against doing so. This is the first time a fish has addressed me by name. However, my favorite Mahler symphony includes a movement about St. Anthony talking to the fishes. The fishes hear the Saint's good advice, but don't change their actions. So I was partially prepared for this conversation. No News is Still News? The opponents had nothing new to say. The tritium leak is fixed, the NRC gave the plant a clean bill of health. A heat-wave was raging with power prices up near $150/MWh and the plant was at 100% power, selling by contract at $45 . What could they say? They said the same old stuff. They said that they are scared of the plant. They SUNG that they are scared of the plant. (Two people sang their testimony.) They brought banners saying No Nukes. Street Theater from top to bottom. No content. The picture shows a man testifying (I don't know his name). The commisioners are at the front table. You can see John Dunn's back (striped shirt on left). John works at the plant. The woman with the banners is taking a picture. The man with the video camera is the controversial documentary maker, Robbie Leppzer. From my point of view, there were several pieces of good news about the meeting. Sure, the statements of the opponents were repetitive and snore-inducing. How long can you listen to "I'm scared. I'm really really really scared?" I guess, about three hours is the limit. David Garrecht of Guilford, Vt., spoke in support the plant’s operation and said he’s concerned that the plant will be closed early due to pressure from the media and opponents of the plant. Garrecht said he isn’t involved with any of the advocacy groups that have formed in support of or in opposition to nuclear energy generation. To which I say: Amen. Step right up! See the outcome of bets on energy usage! Place your own bets in the comment section! Or just have a good time at the Carnival. The IAMVY (I am VY) site is up again, after a long hiatus. A long miserable hiatus. I'm glad to see it back. Two of the people featured on the original I AM VY site were Dave McElwee, a senior employee at the plant, and his daughter, who also works at the plant. 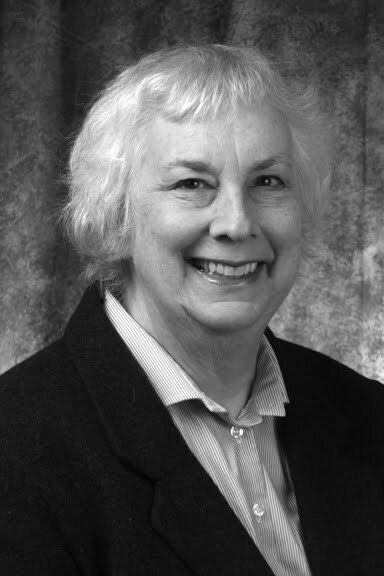 The opponents were ecstatic when McElwee was one of the employees placed on administrative leave during the investigation. You can imagine the ruckus. Shortly after placing McElwee on leave (late January) Entergy took him off the IAMVY site and rewrote his daughter's description of working at the plant. Greenpeace had a field day with this action. On February 10, Entergy took the IAMVY site down. Great joy was expressed in the camps of the opponents. Happily, the site was relaunched a few days ago, featuring plant employees and plant culture again. It's definitely worth a look. The IAMVY site is still controversial. As I have noted in several posts, the Gundersens and their followers are very excited about finding background levels of strontium 90 in Connecticut River fish. I'm talking about background levels, you understand. You could get the same quantities of strontium 90 in your fish if you buy your seafood at the grocery store. However, such mere facts have never stopped an attack when ignorant people have decided to attack. On IAMVY, plant employee Ross Rosinski says he enjoys fishing in the river and eating the fish. Yesterday, on Twitter, Nuclear Fissionary and a local reporter, Shay Totten, were going at it hammer and tongs. The excitement started with Totten's remarks about the employee being willing to eat the fish. I am not sure which person at Fissionary was posting, but I do know that some of the people on the site are recreational fishermen as well as pro-nuclear activists. I am sure that there will be more fireworks on this subject in weeks to come. Sometimes, sometimes, we hope there is a better way. That someday, plant opponents won't make mountains out of molehills. (Background levels of strontium in the fish! Close the plant down!) That nuclear proponents will do a better job of explaining themselves, and especially, of listening. Two excellent recent posts address these problems. Greg Molyneux, of Nuclear Fissionary, asks What Makes Successful Communication? He advises that you start by understanding the audience. Everyone in communication should read this post. In Nuclear Townhall, Gwyneth Cravens describes her journey from Seabrook protestor to nuclear supporter. The post includes her excellent answers to the most common anti-nuclear questions. After all, they were her OWN questions, when she started out. She had to answer these questions for herself, first. Just a little note that Vermont Yankee has been running at 100% during the heat wave, and selling power to Vermont at $45 MWh, by contract. The ISO NE grid was averaging about $130 MWh, as older and more expensive plants come on line. With the cool weather and the end of the workweek, the grid is down to between $43 and $48 MWh today. 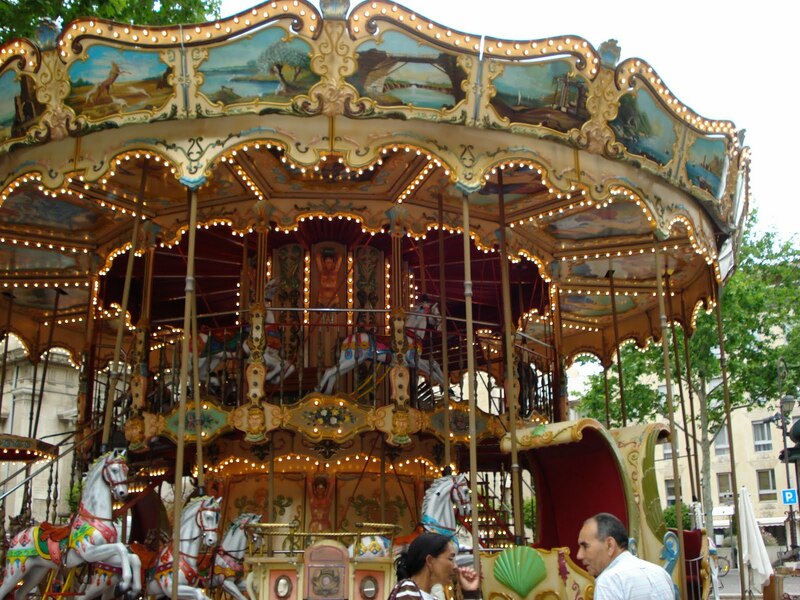 Once again, my picture of the carousel in the main square of Avignon. I like this picture. As I wrote in yesterday's post, there's a meeting tomorrow (Thursday) night at 7 at Brattleboro High School The PSB will meet about Docket 7600, the docket for shutting down Vermont Yankee early. I encourage people to attend this meeting. (There's more information about this docket in my post yesterday's). However, not everyone can attend such meetings. However, you can submit comments to the PSB by email. File a comment using the PSB general Comment Form. I wrote my comment under "other" ( I could not choose "Docket 7600" from the drop-down list). I put the words "Docket 7600" near the beginning of my comment. It only took a few minutes, and I urge you to do the same. Since yesterday, I have received copies of some excellent, inspiring comments which were sent to the PSB by plant supporters. I thank them, and I want to share their comments, in the hopes of inspiring your comments! Theresa Derting posted her message on the Facebook Save Vermont Yankee page, and I have copied it here. John Ewell sent me a post by Facebook Message, and gave me permission to post it here. These two comments are great: well-written and full of ideas. One is short and one is long. Both are effective. My own comment emphasized that shutting down Vermont Yankee would be hard on older or low-income people in Vermont. Be inspired by these comments, steal ideas from them if you want, and file a comment using the PSB general Comment Form. Start your comment with the words Docket 7600. Late News: Nuclear Townhall, a new and influential blog, chose this post as one of their two "best of the blogs" today. I work at Vermont Yankee and I know that it is safe because I do. Entergy has invested enormous amounts of money in updating the facility since it was purchased, and continues to do so now. The tritium leak, even though relatively small by comparable standards, was stopped shortly after it was found, using a careful and methodical process. The company is in the process of implementing further protections to prevent incidents like these. The people who work at VY are committed to the protection of the public AND themselves. I would not work there if there if I was afraid. I would not have my daughter in elementary school directly across the river if I was afraid. Shutting VY down early because of a leak that has already been stopped is a silly notion. Shutting it down early when the effects of the leak are minimal at best is even sillier. Shutting it down early to the detriment of the ratepayers of the state of Vermont would be like the proverbial cutting one's nose off to spite one's face. Please discard this docket as the waste paper it should be. My name is John Ewell. I am a Radiation Protection Technician. I have worked in the nuclear industry for about 30 years, almost 9 years at Vermont Yankee. I am a native New Englander, raised about 15 miles from the Pilgrim Nuclear plant. I now live in Western Mass, having lived in about 20 states. I have worked at 24 different nuclear units, operating and decommissioned. I have also been part of the decommissioning of the Rocky Flats weapons facility in Colorado. So, I have a lot of experience in varied parts of nuclear power. I have worked as the guy mopping the floors, and supervised 25 people in a hazardous waste environment. Vermont Yankee is the place I chose to be my last nuclear plant. I had opportunities within the region at the time I hired on at VY, but I chose VY. I still believe I made the right choice. Vermont is in a unique position of being able to predict their energy production for the future. As renewable energy production begins to take off, Vermont has a predictable, reliable energy source for up to 20 years, while green renewable energy production gets established. Rather than shutting down Vermont Yankee, use this time to setup clean, reliable green energy production. Setup the zoning regulations. Determine exactly what infrastructure and tax incentives are needed to support renewable, non-carbon energy production. Don’t go with the “quick fix”, but really set it up right. Vermont has the chance to show the rest of the country how to do it right. From the start, without time pressure or political pressure to “hurry up”. An early shutdown of VY would be the same as scrapping the family minivan, because it is getting old, and we will have electric cars in the future. But those electric cars aren’t here now. And we still need the minivan to get the kids to baseball practice. If we had a true renewable energy infrastructure in place, shutting down VY may be justified. But we don’t. We still need the power. We can use this time to put it in place. VY will still get us to baseball practice. And to work. And won’t put smog into our air. Recently in CT, a power plant, using natural gas, blew up. Killed 7 workers that spent years building that plant. Natural gas is highly combustible, and that industry is not as highly regulated as nuclear power. Nuclear power in the United States is not prone to these type accidents. The only accident at a nuclear plant (Three Mile Island) didn’t kill or injure anyone. Large scale energy production has it’s risks. But large scale energy production is needed to help our economy recover and grow. A growing economy will be able to pay for renewable energy. But if the energy isn’t there, the economy will not be able to build it. The recent tritium leak at VY is one of the issues that has happened at several other nuclear plants in the country. VY identified it, notified the public immediately, and met the challenge head on. The leak was found, the piping replaced, the leak stopped, and we are in the process of removing the tritium water from the ground onsite. It did not spread to the public. It did not get into the groundwater, because of VYs quick action The remediation will be done quicker than about any other site. Just about everyone onsite worked on this project. We took it personal. People worked long hours, different groups worked together, and I am proud to have been part of the team. What we accomplished will be an example to the industry. It should be an example to the public. Find the problem - fix the problem. That is what VY does. That is what my coworkers believe in. That is “how we roll”. Obviously, I would like for VY to continue to operate. I work there. But also, believe that I work there because I know it is safe. I have worked at other plants. I want to work at VY. I want you to believe in VY the way I do. Look at this as an opportunity to plan for Vermont’s future, instead of a chance to make a “statement” that will be more costly in the long run, both to the industry and workers in the state, and it’s environment. PSB Meeting Thursday Night. Get Your Comments In! The Public Service Board is holding a hearing, Thursday July 8, at Brattleboro High School. The hearing is about Docket 7600. This is the docket to shut down Vermont Yankee immediately. (The relicensing docket is Docket 7440.) The hearing starts at 7 p.m and should be over at 9:30, because the high school does not stay open after 9:30 at night. What's It All About, Anyhow? Why Should I Do Anything? Starting in January, and going through sometime in March, there was a leak of tritiated water at Vermont Yankee. On Thursday February 25, the day after the Senate vote against Vermont Yankee renewal, the PSB opened a new docket, docket 7600, on closing Vermont Yankee early, due to the tritium leaks. As I noted in a blog post at the time, the PSB said they would hold the first hearing on the new docket in March, and I predicted the leak would be over by then. (It was). But of course, it's not over till it's over. Once you open a docket, it stays open. It's like some modern version of Dickens Bleak House--a never-ending court case. The fact that the leak is fixed and being remediated seems irrelevant to the law. "Groundwater is to be managed for the benefit of all Vermonters and the public trust doctrine does not allow for contamination of groundwater, even beneath your own property," he said. "Groundwater flows across property boundaries so these boundaries are meaningless when it comes to public trust resources." I am particularly fond of this quote because it implies that septic tanks are illegal in Vermont, since they do "contaminate" their "leachfields" on your "own property" to some extent. In my opinion, the people attacking Vermont Yankee on the basis of tritium leaks and groundwater contamination have VERY weak arguments. Pretty close to just-silly, as a matter of fact. BUT, when Yankee opponents are the only ones to show up at a meeting, this has an effect. 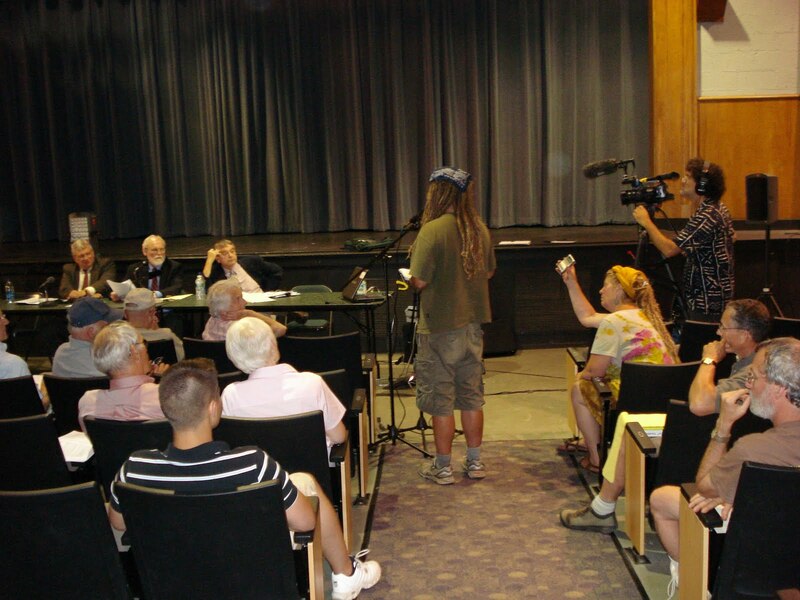 When the PSB sits at the front of the room, looking at the audience, it looks as if everyone is against Vermont Yankee. If there are no supporters at the meeting, the arguments of the opponents seem to carry more weight, no matter how trivial the content of these arguments might be. So, try to attend the meeting and support the plant. What If I Can't Come to the Meeting? "A charge unanswered is a charge believed." A quote from former US Senator Alan Simpson, in Newsweek recently. there is no groundwater contamination outside the plant boundaries, and there will be none (contaminated groundwater is being removed). the plant is a valuable asset to people of Vermont, keeping electricity rates and emissions low. You can write about your own experience with the plant and its safety culture. You can write about septic tanks and groundwater. You can say anything you want, really, as long as it is true and hopefully relevant. You can submit comments by email. File a comment using the PSB general Comment Form. I wrote my comment under "other" ( I could not choose "Docket 7600" from the drop-down list). I wrote the words "Docket 7600" near the beginning of my comment. It only took a few minutes, and I urge you to do the same. Aside: On the Docket 7440 page, at the bottom you can see a link to file a public comment. (This is the relicensing docket.) No such link is at the bottom of the Docket 7600 page, or on meeting announcement for July 8. I am not sure what to make of this. If the meeting tomorrow night is a hearing only, without public participation, there should still be an area in the general docket where the people can file a public comment. I'm not sure why they haven't made it easier to comment on the 7600 docket. End Aside. Come to the meeting or submit your comments by email! Or both! About the cartoon. G. Murphy, the same artist who drew the parody cartoons in a previous post, allowed me to use this original cartoon. The copyright remains with him, of course. This cartoon is about Indian Point. 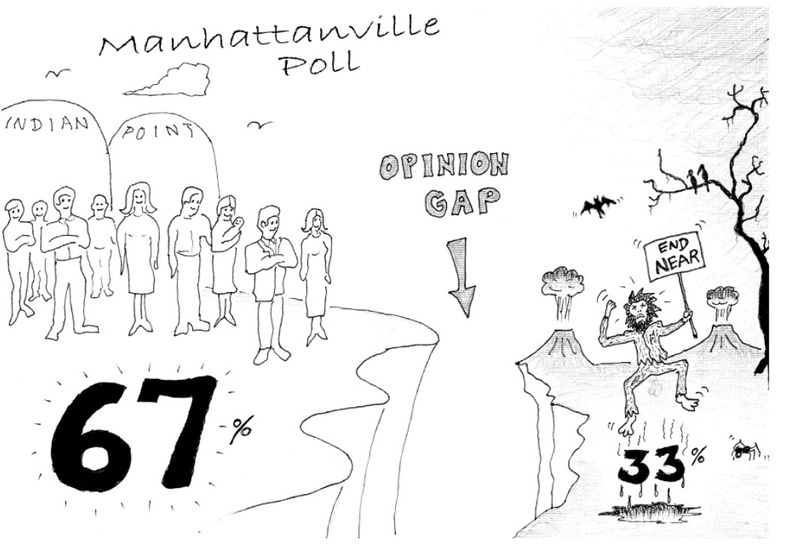 A series of polls taken by the Manhattanville College showed strong local support for Indian Point. 70% pro-plant, 30% anti. However, one of the local papers headlined the survey results: "Residents Worried About Indian Point." This totally misleading headline prompted Mr. Murphy to pen this cartoon, which shows the gap between perceived opinions (of people making a lot of noise) and actual local opinions. On Friday, the Vermont Department of Public Health announced they had caught another fish in the Connecticut River, and it contained background levels of strontium 90 in its bones. The Department of Public Health website says that the fish contained 80 to 100 picocuries per kg in "inedible portions" of the fish. Generally, fish bones are tested for strontium, since strontium behaves similarly to calcium in the body. The Vermont Health Department website made a gallant attempt to put these findings in perspective, noting that: A New York study found background levels of Sr-90 in fish to be in the range of 120 to 360 pCi/kg. Heck, a month ago, I made my own gallant attempt to put strontium levels in perspective in my post, a Radioactive Fish Story. These Connecticut River fish have the same amount of strontium in them as any other fish. When the Vermont Department of Health (DOH) does the heavy lifting, Entergy's Vermont Yankee plant doesn't have to lift a finger. (The) DOH was able to post it on their website late on the afternoon prior to one of the region's biggest holidays... NEWS DUMP. No wonder Vermont Yankee did not want to let all the press know about more contaminated fish and needed some DOH help with the NEWS DUMP. Hope folks along the Connecticut River aren't planning any fish fries for the holiday weekend. Best to throw them back. The fish in the Connecticut River are dangerously contaminated with radioactive strontium. This strontium comes from Vermont Yankee. The fish in the Connecticut River should not be eaten. The Department of Health and Entergy are in deep collusion. Together, they conspire against the people of Vermont. Press releases from the Department of Health reveal terrible things about strontium contamination from Vermont Yankee. However, the Department of Health prepares press releases just before holiday weekends, in the hopes that nobody will pay attention to these releases. The press releases are issued at low-readership times as a favor to Vermont Yankee. The Department of Health's attempts to compare this fish with other fish from other rivers is part of their effort to mislead. This might seem like a grab-bag of assertions, but there is a set of underlying themes. Heavy-duty conspiracy theory: They are all lying to you! Believe only ME! Scares and warnings of imminent danger: Hope folks aren't planning any fish fries! When will the plant opponents stop these conspiracy theory plus scare story tactics? When will they stop telling lies about background versus dangerous levels of radiation? When will they stop maligning Vermont public officials and Connecticut River fish? Fear translates directly into donations, and donations are what anti-nuclear groups require. Isn't it a blooming shame?" I would change the words a little. Both say that the strontium measurements in the fish are background level. Hmm. I'm wondering if I should have labeled Gundersen's comment "news"? If it is predictable, is it "news"? The graphic, from Wikimedia Commons, shows the Coat of arms of Narva town, Estonia. 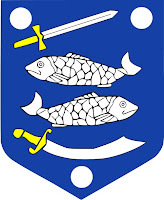 It appealed to me because of the conjunction of fishes and weapons of war. 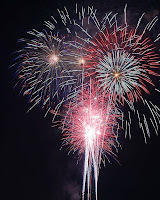 Last night I watched a fabulous fireworks display sponsored by our town: Hartford, Vermont. I happen to live across the street from Kilowatt Park, a park and playing field next to the Connecticut River and just upstream of Wilder Dam. The "Kilowatt" name comes from the presence of Wilder Dam, and the park is there because it is a federally-mandated low-use area (no permanent buildings) near the dam. There's a soccer field, hiking trails, picnic benches. And once a year, the town sponsors a fireworks display with rockets shot above the river. Which is just about as safe as pyrotechnics can be. But What About the French? 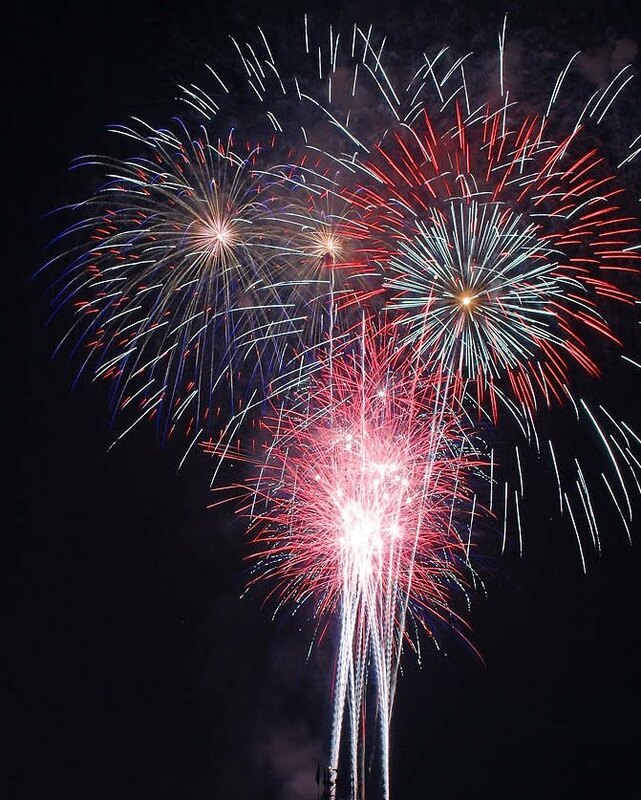 On the Fourth, we remember the American founding fathers and the founding mothers and the Declaration of Independence. We tend to downplay the French connection. The French fought side by side with the American revolutionaries, sending battalions and ships. Lafayette did not come alone. The French government supported the Revolutionaries with their Navy, supplies and troops. Well, yeah, the French government helped us because the "Enemy of My Enemy is My Friend" but the bottom line is...they helped us. Most of the French soldiers in America were volunteers, inspired by ideals of democracy and freedom. I can't get a firm count on this, but there were at least 12,000 French ground troops on our side, as I read various Internet articles. We'd still be singing God Save the Queen if it weren't for the French. Aside: The second verse of God Save the Queen is just plain ridiculous IMHO. "Frustrate their knavish tricks." That's a prayer? That's part of a national anthem? No disrespect to Great Britain or Canada or anybody. But have you ever thought about dropping that second verse? End Aside. We were helped by the French way back when, and we still have a lot to learn from the French. For example, the French recycle nuclear fuel. They have been doing it since 1976, and a group of us visited their facility last month. Steve Aplin of Canadian Energy Issues has an excellent post about our visit. Therefore, in honor of Independence Day, and in honor of the friendship between America and France, I am sharing a ten minute video about fuel recycling at La Hague. Happy Independence Day to all Americans! And while we are at it: Vive La France! The Eighth Carnival of Nuclear Energy is up at Next Big Future. The Glorious Fourth is a great day for a Carnival. Stop over and enjoy yourself. Sometimes something so good comes along that I have to share it. E-Rob's I Do Nuclear Power.